It’s a chilly night in January, the phone is by my bed as I anxiously await a call to let me know it’s time; by 3:00 a.m. the phone rings and the voice on the other line says “We’re on! Meet us at the farm.” Layer upon layer of clothing are added, as is my winter jacket, snow pants, warm hat, gloves and snow boots. I look like a rainbow attacked the Michelin Man, but I don’t care, I’m outfitted in warmth, not vogue. It’s a beautiful calm night, there’s no wind, the moon is bright and the stars are twinkling. I overhear a fellow Icewine picker mention that nights like these are rare, but warmly welcomed. We promptly get to work, pulling off netting, removing frozen grape bunches and placing them in baskets. Once the crew gets the hang of the task, chatter and chuckles ensue as a mechanism to ease the mind from the cold. 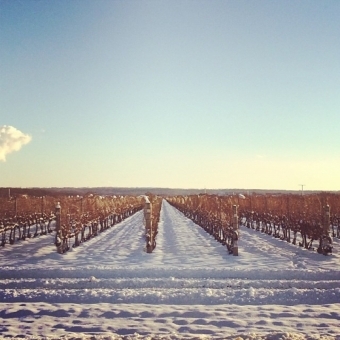 It’s -10°, the ideal temperature for an Icewine harvest, but it feels much colder. I distract my mind by joining the conversations of day jobs, school assignments, movies and T.V. shows. The demographic of the crowd ranges from students, ‘9-5-ers’, farmers, family members and friends; young and old, male and female, we all are united during this eventful evening. After the frozen grapes have been harvested, they are brought to a barn and pressed in a hydraulic press that releases the sweet sugary juice from the frozen berries. 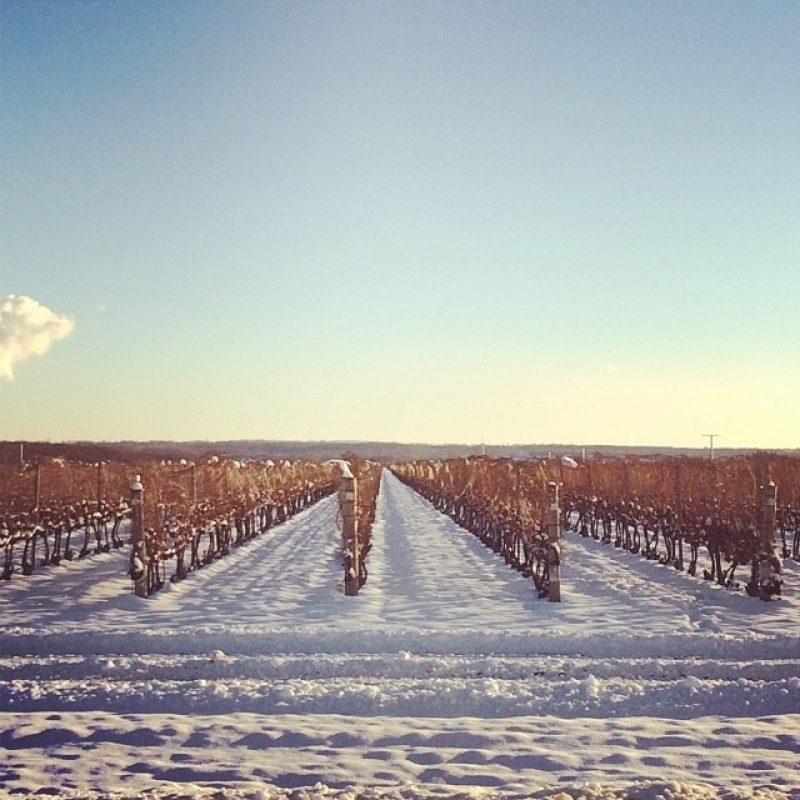 After fermentation, the process that transforms the sugar into wine, the sweet juice has now become Icewine. If harvesting frozen grapes is not for you, but the sweet tipple is, then join Twenty Valley the weekend of January 15 – 17, 2016 for their Winter WineFest in Jordan Village, Ontario. The main street will be decorated with fire pits to warm toes and noses; food and wine stations to quench appetites and eager tasters, as well as twinkling lights and ice sculptures to continue the ice theme. Spend Saturday and Sunday strolling the main street; sample wine and food pairings, enjoy live music featuring local artists, and shop the quaint stores that line the street. Watch a live fashion show (you may recognize a face or two on the catwalk) and cheer on your favourite winemakers as they battle it out in the Annual Barrel Rolling Challenge. Saturday evening, treat yourself to a decadent five-course dinner created by Chef Lynn Crawford with wine pairings from Twenty Valley’s wineries. If you are a night owl that enjoys a good party, the ultimate After Party in the Barrel Cellar at Cave Spring Cellars is for you. Sample craft beer and local wine, nosh on hearty bites prepared by the kitchen upstairs and dance the night away to live music. Sunday, after a much-needed sleep-in, head to Inn on the Twenty for an Icewine-infused three-course brunch prepared by Chef Lynn Crawford and savour every delectable and delicious bite. Before heading home, take the scenic route and visit a couple of wineries in Twenty Valley. Pick up a few new favourite wines to share with family and friends while reminiscing on your Winter WineFest weekend. Admission to the Street Festival is complimentary; tokens can be purchased for wine and food samples. Visit twentyvalley.ca for to purchase event tickets.